This month, we made some big changes to The Doll Gallery. Some old favorites have gone to storage for a time so that they can be protected from light, which will help preserve them for future generations of museum visitors. More than 30 dolls have come out of storage to take their place, including a rare, late 19th century baby doll by Leo Moss. Leo Moss, a handyman in Macon, Georgia, made his portrait dolls in the likeness of family, friends, and members of the community. His dolls are classified as character dolls because they have realistic facial features and expressions that convey specific emotions. Many Leo Moss dolls portray crying children, but Baby Moss is depicted as a happy baby. There are a couple of theories about why some of Moss’s dolls appear to be crying; the more popular theory is that Moss would include tears if his young model became distressed and started crying while Moss was working on the doll. X-ray images and CAT scans done by diagnostic radiologist Dr. Steve Eilenberg of three Leo Moss dolls in 2014 revealed intriguing information about Moss’s techniques. (https://aperturephotoarts.com/leo-moss/) The three dolls studied all showed commercially-made composition doll heads, covered with sculpted papier-mâché to achieve the models’ likenesses. The original composition heads are not discernable in the finished dolls. Using this method, Leo Moss produced dolls of exquisite artistry. In addition to Baby Moss, the gallery includes five other dolls with papier-mâché heads, ranging in date from about 1830 to 1895. These dolls feature molded heads rather than Moss’s sculpted technique. Two 26″ dolls with papier-mâché heads and cloth bodies look like they could have been made by the same company. Yet one was produced in Germany by Müller & Strassburger, while the other was made by Ludwig Greiner, a German-born American. Greiner immigrated to the United States in the 1830s, and in the 1840s, started his company in Philadelphia. In 1858, Greiner received a patent for his method of reinforcing the papier-mâché doll heads. 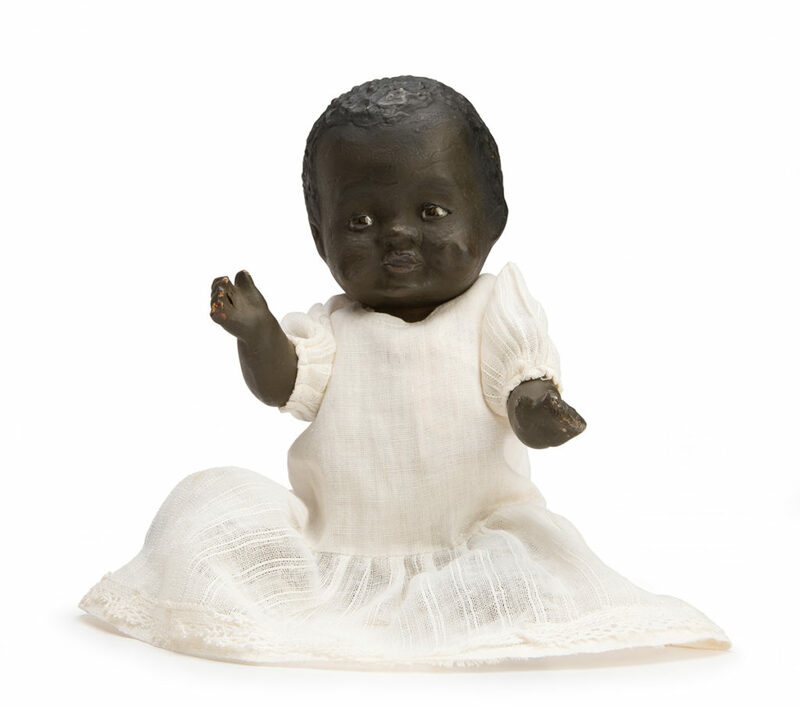 The patent was extended in 1872, so this doll’s markings indicate it was made before that date. It was common for dolls with papier-mâché heads to have hand-made cloth bodies, but this Greiner doll has a body designed by his friend and fellow-Philadelphian, Jacob Lachmann. We hope you’ll get a chance to visit T/m and our updated Doll Gallery. Check back later this year for blog posts on some of the other featured dolls and the people who made them. T/m’s newest special exhibit, Going Places: The Toy Collection of Jerry Smith, features toys collected by Jerry Smith (1917-1984), a Kansas City automotive dealer and philanthropist whose generous heart and fabulous toy collection left a lasting impact on the community. It was the Christmas of 1924 that would later inspire Smith to start collecting toys. 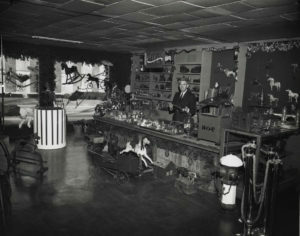 The holiday was a big event for six-year-old Smith, who circled the toys he longed for in the Sears and Roebuck catalog. As the youngest of six, the Kansas farm boy was depending on Santa to fulfill his dreams. However, there was only one present waiting for him under the tree: a cast iron Arcade Fordson toy tractor. 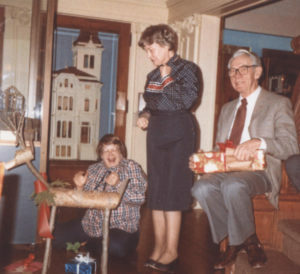 One Christmas, Smith’s sister-in-law gifted him an identical version of his now long-lost Arcade Fordson tractor. He was overjoyed and realized there were more toys in the Arcade series. 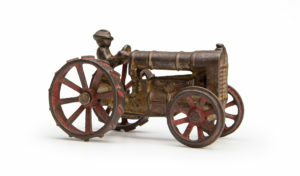 He set out to collect the entire set, and soon moved on to other toys that reminded him of his childhood: planes, trains, automobiles, farm toys, mechanical banks, fire engines, and transportation toys of all kinds. Eventually, Smith collected over 11,000 toys. Following his philosophy of helping others, Smith used his collection to benefit the community. Whenever his collection was put on display, he would request that a fee be donated to a Kansas City charitable organization, usually Children’s Mercy Hospital. 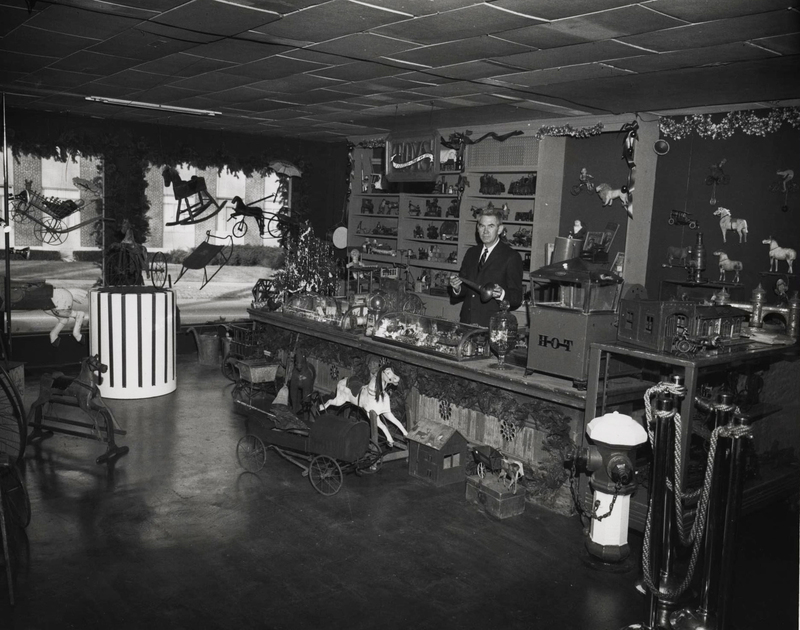 During the holiday season in 1965, Smith’s collection was exhibited at the Hallmark Gallery on Fifth Avenue in New York City. Over 130,000 visitors attended, and all the proceeds went to a youth organization. Smith even appeared on The Tonight Show with Johnny Carson to promote the exhibit; the entire video is available to view in the exhibit. 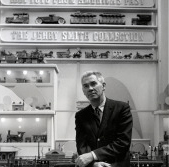 Jerry Smith with a 1968 toy exhibit at the Hallmark Gallery. Image courtesy of the Hallmark Archives. Back home in Kansas City, Smith’s collection was exhibited at the Wornall-Majors House and the Kansas City Museum. 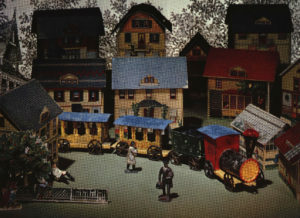 Smith also created the Christmas Village, which featured festive holiday dioramas in the Long-Bell Lumberyard at Gregory and Wornall. Smith requested that admission proceeds go to Children’s Mercy Hospital. By 1967, Children’s Mercy had received over $25,000 from displays of Smith’s toys. Smith’s philanthropy continues to influence the Kansas City community. 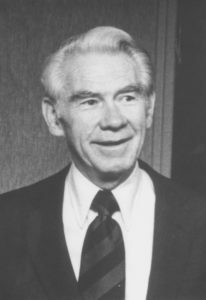 His charitable contributions reached organizations including the Kansas City Museum, the Boy Scouts Area Council, Avila College, the Rehabilitation Institute, Children’s Therapeutic Learning Center, and more. In 1976, Smith donated his 360-acre farm to the Kansas City parks system, which is still used as a park today. Last but certainly not least, Smith helped T/m founders Mary Harris Francis and Barbara Marshall assemble some of their earliest exhibits. Many of the cast iron and transportation toys T/m has on display in the permanent exhibits today came from Jerry Smith’s collection. For Jerry Smith, a disappointing Christmas turned into a lifetime of giving. As the Kansas City Star remarked in 1966, “Perhaps none of this would have happened if Santa Claus had come through with the entire list submitted by Jerry back in 1924. 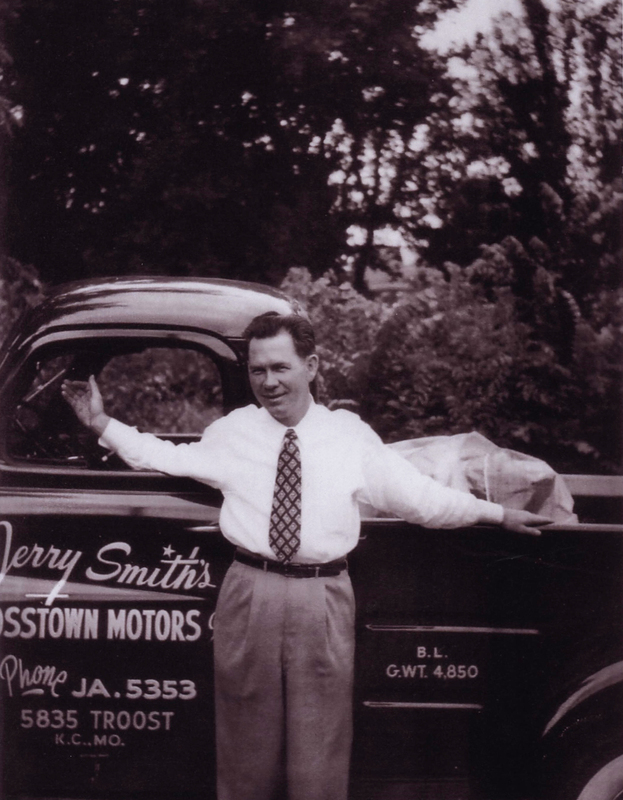 Maybe Santa knew what he was doing after all.” During your next visit to T/m, be sure to stop by Going Places to learn more about the incredible toy collection and lasting impact of Jerry Smith. There are miniatures, and then there are micro-miniatures. Yes indeed, the smallest of the small works of art are best viewed through a microscope or magnifying glass at the Museum of Miniatures in Prague. This mind-blowing museum features the works of professional microminiaturists Anatolij Konenko, Nikolai Aldunin, and Edward Ter Ghazarian. Visitors to the museum can expect to see super-small works including a flea wearing horseshoes, a caravan of camels in the eye of a needle, and a grasshopper playing a violin. Like miniature artists working in a variety of scales, microminiaturists create many of the tools they use to get the precision necessary for these super-small works. Amazingly, Konenko creates his work between his heart beats in order to account for the small tremor that occurs with blood circulation in the fingers. Now that’s a finely tuned artistic process!